Posted November 10th, 2018 by BitX Funding & filed under American Express Business Loans. Amex Business Card members who are looking for a medium-term loan can tap the company’s aptly named Business Loan product. You can check your pre-approved rate online through your American Express Business Loans account and then apply for the loan at the quoted terms at any time. Amex’s business loans use a traditional APR rather than a flat fee to calculate your interest. The better your credit, the better your APR will be. And the shorter your term, the less interest your loan will accrue. Payments are monthly and, as is the case with Amex’s other products, there are several payment methods to choose from. 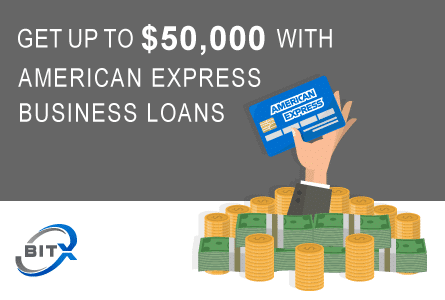 If you, not an Amex Business Credit Card Member you need to become a member to get the benefits of most American Express Business Loans funding products. Find out if you’re pre-approved by logging into your American Express account. You’ll see how much you could borrow and your maximum rate. Tell us how much you need up to your pre-approved amount. Then select a monthly payment option and provide some additional information about your business. If approved, we’ll disburse your funds in 3 to 5 business days once you review the terms and accept your loan. Hey there superb blog! Does running a blog similar to this take a great deal of work? search engines’ spiders together with your visitors. your internet traffic and obviously your revenues. and funds over time and earned their undying gratitude inside process.